Confidently store, share, and retain your most important information with StorNext® Appliances. Now you don’t have to choose between the shared-storage benefits of NAS and the high-performance scalability of a SAN. 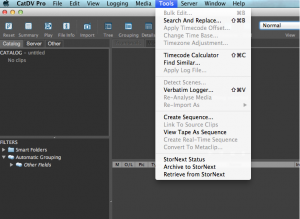 StorNext data management software gives you the best of both worlds. By combining efficient file sharing and data archiving with transparent tiered storage, you get unrivalled performance and scalability. And that helps customers like you keep moving your business forward by storing information rapidly, sharing it across platforms, and preserving it cost-effectively over time. Learn more about Quantum StorNext data management appliances and how it helps other customers accelerate their business at www.quantum.com/StorNext. 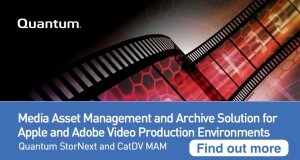 CatDV and Quantum are a great choice for all your asset management and archiving needs . QLS Archive brings you a tight integration with their Quantum Storage Manager Archive Additions Plug in for CatDV. It supports archive, purge (deletion of on-line files), backup (archive then purge) and retrieve operations for all media formats and types supported by CatDV. Comprehensive record keeping within CatDV of status from StorNext and reporting of detailed archive statistics and health, keep you Quantum Certain with your storage and archiving. The QLS Archive plug in provides the user with additional tools accessible within the desktop client. These are: StorNext Status, Archive to Stornext and Retrieve from StorNext. The menu additions are only given to the people that you nominate. When it comes to archive we do recommend that you put the responsibility of clip storage into knowledgeable hands to prevent multiple users putting through requests for clip retrieval. The Worker Node is used to carry out the file movement to StorNext so that it doesn’t tie down the CatDV work station. The QlS Archive integration uses the Worker Node to submit the request to archive, and the QLS plug in follows the request through various state changes to Quantum. The job is then handed over to Quantum to submit the files to storage. The clips go through a process of being on disk, on disk and tape, and then finally on tape alone. For a completed archive we need to tape ID so we know exactly which tape houses our clips. QLS Archive make use of the status fields within CatDV to report what is going on within the archive process, and also report to barcode label ID within the status fields. CatDV has the ability to show whether the media is online and playable, or is offline, so sent to archive. Therefore these status fields will allow any CatDV user to see why their clip is offline – where it has been sent to archive. In these cases there may be a proxy available which can be played back, however the high def content has been sent to tape. * We have also been working with lattice and cloud storage so we can report location, whether that is a tape or in the cloud. But primarily due to high speed of throughputs with Quantum Storage Manager we suggest working with LTO 5 and LTO 6 connected devices.